Auxiliary Schooner/Q-Ship: Built in 1903 at Essex, MA; Acquired by the Navy, 13 August 1918; Commissioned, 14 August 1918 at Boston, MA; Decommissioned in November 1918; Struck from the Naval Register, 27 March 1919; Sold, 11 November 1919. Fate unknown. Specifications: Displacement 123.28 t.; Length 113' 4"; Beam 25' 9"; Draft 14' 9"; Speed eight kts. ; Complement 25; Armament unknown. 130k Under sail, circa mid-1918. 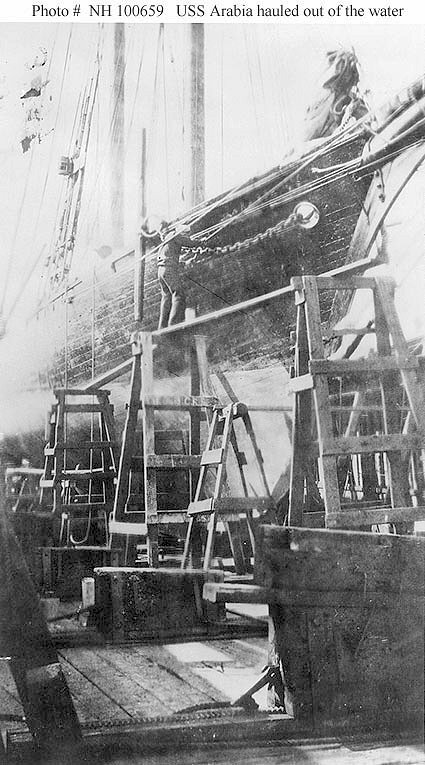 85k Hauled out of the water, probably while undergoing a formal material inspection at Boston, Massachusetts, circa 23 September 1918. 94k Hauled out of the water, probably while undergoing a formal material inspection at Boston, Massachusetts, circa 23 September 1918. 81k Hauled out of the water, probably while undergoing a formal material inspection at Boston, Massachusetts, circa 23 September 1918. 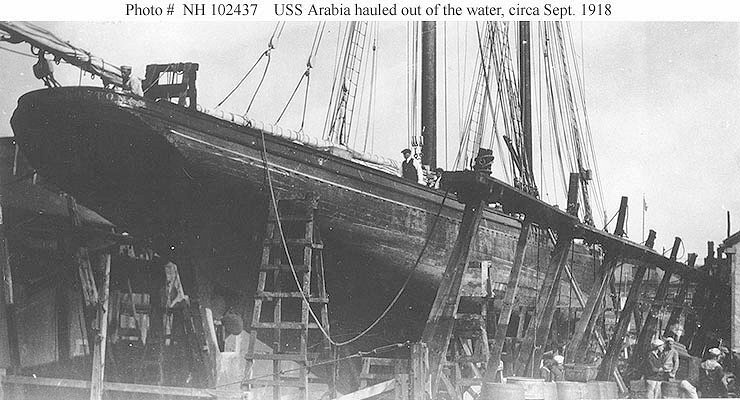 Dictionary of American Naval Fighting Ships History: Arabia (Id. No. 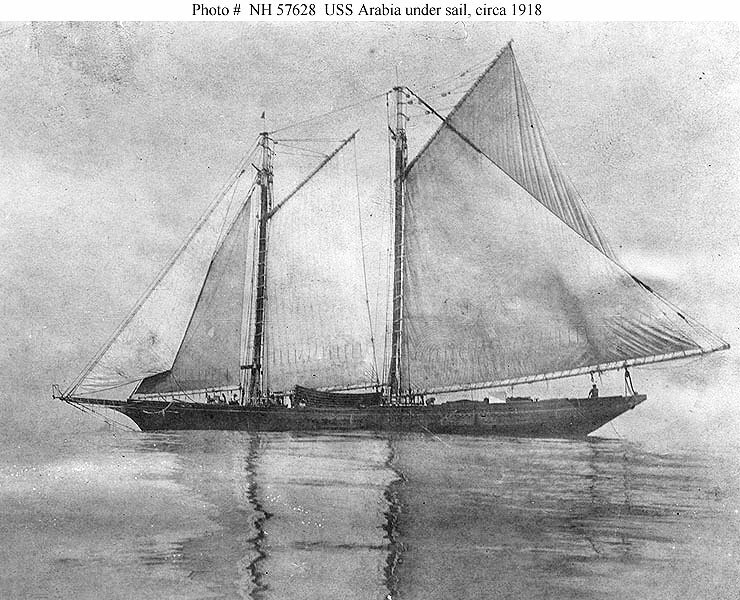 3434)-an auxiliary fishing schooner constructed in 1903 at Essex, Mass.-was acquired by the Navy from the Commonwealth Fisheries Co. on 13 August 1918 and commissioned at Boston on 14 August 1918, Lt. (jg.) Lester F. Rogers in command. 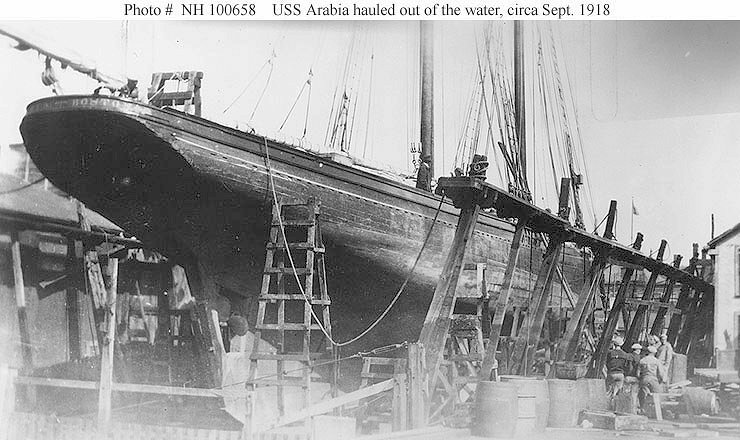 Arabia was acquired by the Navy for the specific purpose of serving as a. decoy ship in the hunt for U-1 17, a German submarine which had created havoc with the New England fishing fleet during the summer of 1918. In addition to a Navy crew of two officers and seven bluejackets, 19 fishermen-16 of them from Arabia's original crew-were recruited into the Naval Reserve Forces to lend an aura of realism to the operation. The Q-ship set sail from Boston on 14 August and shaped a course for George's Bank. Once there, she operated in concert with the submarine N-1 (SS 53) until after the armistice ended World War I. She apparently concluded her one and only cruise on 27 November 1918 and was decommissioned soon thereafter. Her name was struck from the Navy list on 27 March 1919, and she was sold to Mr. W. V. M. Powelson, of New York City, on 11 November 1919.